The Foundery stood in the Lamb Inn yard. In the thirteenth century, this area bounded by Red Lion Street, White Lion Street and the Haymarket was the Jewish quarter. It was completely destroyed by fire in 1286. A church was built on part of the site. It was eventually converted to an inn and took the name ‘The Holy Lamb’ or, simply, ‘The Lamb.’ In addition to the Lamb Inn, the Goose and Gridiron Inn stood here, together with a grand house which had once been the home of Sir Thomas Browne, physician and author, in the seventeenth century and Mr Edwards’ house where both Charles and later John stayed whilst in the city. 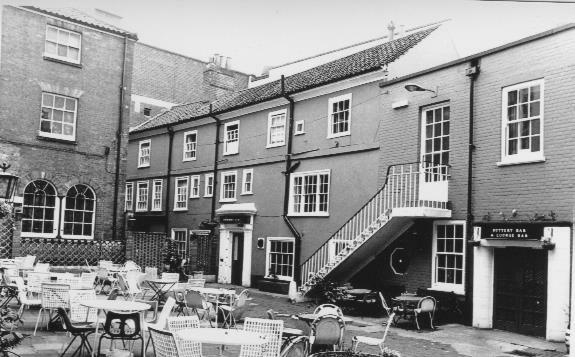 Charles, who remained in Norwich in the summer of 1754 after John’s departure, searched for a preaching house safe from the attacks and disturbances of the mob and from the ravages of the weather. A Justice of the Peace and City official, John Simpson,  who had heard one of the first sermons preached by Charles in Norwich, offered him the lease of the brew house which stood in the same yard. This building had originally been a bell foundry and Charles noted the significance of it having the same name as the Methodist centre in London. It was utterly ruinous. Simpson sent his workmen to repair the building. This clearly was a major task as the premises were not licensed for worship until October 1755. A small Methodist society of about eighteen members was established while Charles was in the city and a number more gave in their names before he left including one who had belonged to a Methodist society in London and another in Newcastle. As in a number of other places round the country, it had been Charles Wesley rather than John who had first preached in Norfolk and it was Charles who established the first Methodist society in the county. In February 1757, John Wesley was pleased to be able to visit the Norwich Methodist society. I had long desired to see the little flock at Norwich, but this I could not decently do till I was able to rebuild part of the Foundery there to which I was engaged by my lease. A sum sufficient for that end was now unexpectedly given me by one of whom I had no personal knowledge. I set out on Monday 28th . He arrived in time to preach there on Tuesday evening, the day following, and after preaching I entered into contract with a builder and gave him part of the money in hand. The building was to be the home of the Methodists in Norwich for about seven years. The new Methodist society in Norwich was incorporated into the Methodist system of organisation. As other Methodist congregations were established in Norfolk, Suffolk and part of Essex, they were gathered into the huge Norwich circuit. From the autumn of 1754, itinerant Methodist preachers were stationed in the city. The first was Samuel Larwood who had been sent to Norwich by the Wesleys the previous year. In the earlier years, preachers were moved on every two months. This was extended to four months in 1758, but the drawbacks of such an arrangement soon led to a further change so that by the 1760s a year had become the usual time allotted. In 1784, the maximum length of service in any one circuit was extended to three years. The Foundery building was given up sometime after in 1761 and the congregation joined that at the Tabernacle at St Martin-at-Palace Plain. John and Charles Wesley always spelled the name in this way. Life …, Jackson, op. cit., vol. ii, p.50-1. He was a glover by trade and held various public posts in the city. He was Sheriff in 1755. The Journal of the Rev. John Wesley, A.M., ed. Nehemiah Curnock, 1909-16, London, vol. iv, pp.197-8.